I won this book last year from Erik, over at Thiskidreviewsbooks.com. (Thanks, Erik!) Since Halloween had just passed, my son and I waited to read it till the season rolled around again this year. We’re only about halfway through, but I thought this would be a great time to post a review. Because the book is actually a collection of unrelated short stories. Scary ones that my son is really digging this time of year. The coolest part? Every story ends unfinished. To find out what happens, you have to log into Mr. Carman’s website, 315stories.com and watch a short video. Each of the 10 stories comes with two passwords that you type into the website—one for a brief intro, and one for the dramatized scary ending. Videos range between one and three minutes in length and they’re professionally done (meaning they aren’t hokey). It is a really original concept and my son loves it. My only complaint is that the vast majority of heroes and heroine die. Not that it’s graphic or nasty; you just know there’s no way the poor kid makes it through the frightening climax. But some of them leave you with a bit more mystery, and I thought those were more fun. 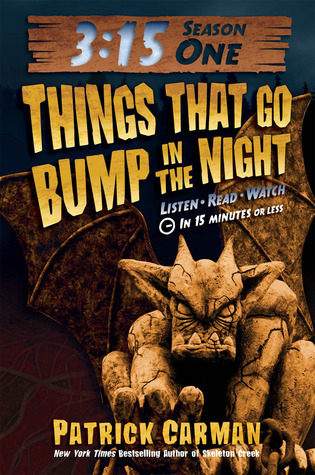 If you’re looking for goose bumps but not horror, Things That Go Bump in the Night is a great pick. I’d say it’s appropriate for kids age 9+. Previous Sea Cutter in Paperback! Glad you guys like the book! 🙂 I thought it was totally CREEPY! We love the videos! Great Halloween pick. Thanks again, Erik! Sounds like a great Halloween read for kids, but I’m not into scary. Unusual approach to a book. Like the website interaction. It is unique and pretty mild. Very fun for kids.